You might have noticed certain incompatibility error messages while opening high quality images in low end mobile phones . 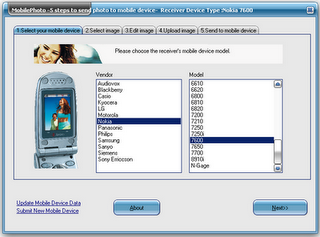 So we have convert these images or crop their size to match the criteria for each mobile phones .MobilePhoto is a free software that can modify the size and quality of the images before moving them to mobile devices .You can select your phone from the given list and configure photo output options to match the device . A shown above ,select the required phone and click next .Open image , perform editing and transfer to the target mobile device . Download MobilePhoto and edit photos before they are moved to mobile phones .